Although originally tied by American angler Don Gapen to imitate a small fish similar to a miller’s thumb, the Muddler has since become transformed into an incredibly versatile range of patterns. These range from outand- out lures such as those tied with gold bodies and orange or yellow wings to wonderful imitations of grasshoppers, fish, adult stoneflies and even mice. This gold and brown version is a hybrid of the two. 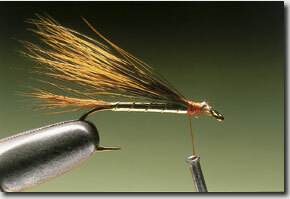 Tied big and bushy it can be stripped across the surface to stimulate the trout’s aggression or inquisitiveness. Tied smaller it can be quite imitative, suggesting anything from a sedge to a stickleback. The key to the Muddler’s success is its buoyant, bulbous head, which is formed from deer body hair spun on the hook then clipped to shape. When forming a Muddler head the trick is to be able to spin the hair evenly around the hook then to lock it in position so that it doesn’t revolve. Adding the hair in sections rather than one big bunch solves this. So once each has been spun, if necessary using the fingers to ease the hair evenly around the hook, repeated tight turns of thread are wound through and finally in front until the hair is secure. Only then is the next section added. 1. Fix the hook in the vice and run on close turns of thread down the shank to the bend. There catch in a pinch of red fox squirrel tail plus three inches of fine oval gold tinsel. 2. Cover the waste ends of the hair and tinsel with thread. This provides an even base for the body. Take four inches of gold mylar tinsel, cut one end to a point and catch it in well back from the eye. 3. Wind the flat tinsel down the hook to the base of the tail. When that is reached wind it back to its catching in point. This double layer helps to create a smooth body. 4. Secure the loose end of the tinsel and remove the excess. Take hold of the oval gold tinsel and wind it over the body in five open, evenly spaced turns. 5. Secure then remove the loose end of the ribbing material. Select a slim bunch of well-marked red fox squirrel tail. Tease out any damaged fibres and fluff and position it on top of the hook. 6. Add a few tight turns of thread then wind two or three turns around the base of the hair itself. These locking turns help the thread to grip the slippery hair. 7. Add further tight turns of thread around both the hair and the hook. This will fix the wing securely in place. Trim away the excess hair butts with scissors. 8. Remove a bunch of deer hair with dark well-marked tips from the skin. Remove any fluff or broken fibres and position with loose turns of thread so the tips project over the wing. 9. Begin to pull the thread tight. As you do this the hair, being soft, will begin to flare around the hook. Ease it around the hook so that it forms an even collar. Pay particular attention to the tips. 10. Wind tight turns of thread through the hair to lock it firmly on to the hook. Take the thread to the front of the deer hair and make further tight turns. This will form a solid base for the additional hair. 11. Take a second bunch of deer hair and trim away the tips. Position it in front of the previous bunch and apply tight thread turns so that it spins evenly around the hook. 12. Cast off the thread at the eye with a whip finish. Take a pair of sharp scissors and begin to remove the excess hair. Work with small snips, rotating the hook so that hair is removed evenly all round. 13. Keep the hair on top and sides of the head longer than on the underside. Finally, trim away excess hair around the collar, taking care not to remove any of the mottled tips of deer hair. 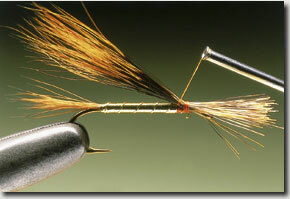 Muddlers catch fish on all types of stillwaters but are most effective when fish are feeding actively. 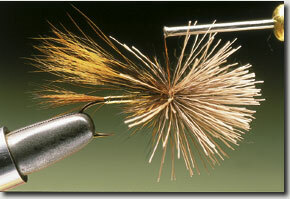 Depending on its size and colour, the Muddler can represent small fish, sedges or grasshoppers. Muddlers will take fish throughout the year, though midsummer into autumn is the most productive period as this is when the trout are feeding most actively on larger prey. The Muddler is effective fished on virtually any line density. 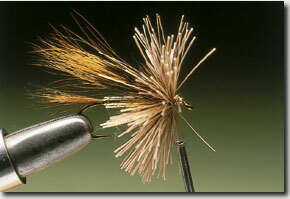 Tied small and bushy it makes a great bob-fly on a wet-fly cast. Conversely, tied large and fished on a fast-sinking line it will take trout feeding on coarse-fish fry. When spinning deer hair, don’t try to apply too much at a time, and always ensure that each bunch is fixed firmly in position before adding another.